We are excitedly awaiting Monday 16 July, when the UK’s very best parks and green spaces will be announced – winners of the Green Flag, and Green Flag Community, Awards. The Green Flag accreditations team have travelled the country, visiting the parks and green spaces – talking to park staff, green-space managers and volunteer groups and very soon the Green Flags will be proudly flying over the country’s very best green spaces. 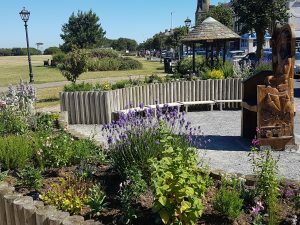 While you wait, why not start planning your next trip to Silloth Green which has been awarded a Green Flag for the last five years and recognised as one of the UK’s very best green spaces. Enjoy a picnic on the Green. Visit the water splash park, the woodland play area or BMX track with the kids. Relax in the Community garden and keep an eye out for the bees and butterflies in the Heritage Rose and Bee garden. Explore the fairy trail in the pines and have a go on the ‘Gnome in One’ putting green or simply sit and relax on one of the many seats located around the Green. Many of us have fantastic memories that started in a park – whether it’s flying a kite with our grandads, time spent with friends, teaching our own children to walk, or a hundred other things – parks bring people together. That’s why – this Love Parks Week, 13-22 July 2018 – everyone is invited to get down to their local park or green space and celebrate all the amazing things that ‘started in a park’.